Soon after the Fall of Constantinople in 1453, at the request of the Mohammedan conqueror Sultan Mehmed II, Gennadios prepared a Confession of the Christian faith. 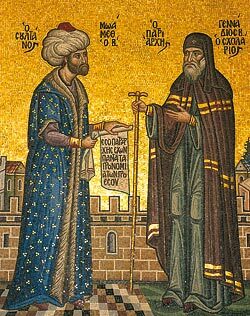 The Sultan received it, invested Gennadios with the patriarchate of Constantinople by the delivery of the crozier or pastoral staff, and authorized him to assure the Roman Christians of freedom in the exercise of their religion. This Confession of Gennadios, or Homily on the True Faith of the Christians, was written in Greek, and translated into the Turko-Arabic (Turkish with Arabic letters) for the use of the Sultan. It treats, in twenty brief sections, of the fundamental doctrines on God, the Trinity, the two natures in the person of Christ, His work, the immortality of the soul, and the resurrection of the body. The difference of the Greek and Latin doctrine on the procession of the Holy Spirit is not touched in this Confession. The relation of the divine and human nature in Christ is illustrated by the relation of the soul and the body in man, both being distinct, and yet inseparably united in one person. At the end are added, for the benefit of the Turks, seven arguments for the truth of the Christian religion. 1. We believe that there is a God who created everything that exists out of nothing. That He is not a body, nor does He have a body, but He exists only as Spirit. He is an excellent mind, perfect and full of wisdom. He is simple, without beginning and without end. He can be found in the world, as well as above the world. He is not found in a particular place, but is found everywhere. These are the properties of God, which separate Him from His creation and other similar things. He is wise and good and true. And He is truth. And whatever qualities His creatures have separately, He has them all to a higher degree. His creatures have these perfections, because He Himself gave them. For, since He is good His creatures are also good, since He is wise His creatures are also wise, since He is true they also are true, and it is the same with the other virtues. But while God has them as property, they have them because they participate in Him. 2. We believe that there are in the one God three properties, which are the principles and sources of all His other properties. And with these three properties God lives eternally in Himself, before He created the world, and with these three properties He created the world and with them He governs it. And these three properties we call hypostases. And because these properties do not separate the one simple essence of God, this is why God with these three properties is one God and not three gods. 3. We believe that out of the nature of God rose the Word and the Spirit, as from the fire come light and heat. And just as with fire, even if it has nothing to illuminate and heat from it still has permanent light and heat and emits light and heat, so also before the world was created there existed the Word and Spirit as natural energies of God, because God is Mind, as we have said. And these three: Mind, Word and Spirit are one God, just as in the one human soul there is the mind, the rational word and the rational will; and yet these three are essentially one soul. We also call the Word of God the wisdom of God and the power and His Son, because He was born from the nature of God, just as that which is born of the nature of man is called a son of man, and just as the thoughts of man are born from his soul. We also call the will of God the Spirit of God and love. The Mind of God we call Father, because He is unbegotten and uncaused, while He is the cause of the Son and the Spirit. That God therefore perceives not only His creation, but even more so perceives and knows Himself, this is why He has reason and wisdom through which He eternally perceives Himself. In the same way God does not only want to love His creatures, but even more He wants to love Himself, which is why there eternally comes from God His Word and Spirit and they exist in Him eternally; and these two with God are one God. 4. We believe that God with the cooperation of the Word and with His wisdom and power created the world, and with His Spirit, His good will and love, He provides and governs all of nature in this world towards the good, according to the order of creation. And this is why we believe, that when God wanted only out of His mercy for humanity to return from the errors of demons and idolatry (because outside the small country in which the Jews lived, in which they worshiped and believed in one God who gave them the Law of Moses, the entire inhabited world revered the creatures of God and not God, and they believed in many non-existent gods, instead of believing in the one and true, and people lived according to their own desires and not in accord with some Law of God), God accomplished the regeneration of man through His Word and through His Holy Spirit. For this the Word of God clothed Himself in human nature, so that as a man He may speak to men, as the Word of God and wisdom He could teach people to believe in the one and true God, and conduct themselves according to the law He gave. Also as a man to give by His conduct an example of His teachings, for He was the first to keep the law He gave to men. And as the Word of God and power, He was able to accomplish the universal good, as He wanted, for it would have been impossible with the power of only one man to return all of the universe to God. And so by His Word the almighty and invisible God sowed the seed of truth in Jerusalem, and through His Spirit He illumined and strengthened His apostles, in order to sow the seed of this truth throughout the world, and to despise death through the love of this truth they taught, for the love of God who sent them, and for the love of the salvation of the world, according to the example of Jesus, who voluntarily died according to His human nature for the salvation of the world. Thus we believe in the one God in Trinity, Father, Son and Holy Spirit, as our Lord Jesus taught us. And because He speaks the truth and is the truth Himself we believe that this also is the truth. And His disciples taught us so extensively. We also understand this by the power of wisdom. 5. We believe that the Word of God and the form of man assumed by the Word of God is Christ, and the life of Christ physically was the life of a most-holy man, while the power of His wisdom and works was the power of God. We believe that just as the soul and body of a man consist of one man, so also the Word of God on the one hand and the soul and body of the Son of holy Mary on the other hand consists of one person: Christ. But just as soul and body are two natures completely separated in man, so also in Christ the two natures, the human and divine, are completely separated. 6. We believe further that neither the Word of God changed in the body or soul of Christ, or that the body of Christ or His soul became the Word of God, but that in the person of Christ the Word of God always truly was and is the Word of God, and that His human nature was truly a human nature. We also believe that Christ as man did not receive divinity, but the divinity of the Word of God received human nature and created this wonderful event. Everything which is in God and comes from God by nature is God, because there is nothing in God which does not belong to His nature. And that is why the eternal Word of God we call God and believe to be God. And because this Word of God is part of the entity of Christ, this is why we confess Christ to be God and man. Man according to soul and according to body, God because in His entity exists the Word of God. 7. We believe the Word of God was present in Christ and in the world and in Heaven and in the presence of God the Father, because the Word of God is infinite, just as God is infinite who begets Him, namely having infinite understanding and power. But He was in the presence of the Father in one way, and in another in the entity of Christ, and in another in the world. 8. We believe that when God imparts His goodness and grace to a certain creature, He Himself is not harmed at all, but rather He is glorified because by the virtue of the creature the glory of God is revealed. And the more the creature is improved with the increasing transmission of love, the more the goodness of God and His love towards humanity is revealed. This is why the goodness of God and His love for humanity became much greater when the Word of God and God came in all His power in the person of Jesus, more than when He sent His Prophets a portion of His grace, while sending some Prophets less and others more. 9. We believe our Lord Christ was crucified and died voluntarily for many and important reasons that benefit us and which need many explanations. And all this He underwent as man, because the Word of God can neither be crucified, nor die, nor be resurrected, but rather He resurrects the dead, just as He resurrected the body He received. 10. We believe that Christ after His resurrection ascended into the Heavens, and will come again in a glorious way to judge the world. 11. We believe the souls of people are immortal, that the bodies of the saints will be raised imperishable, without passions, bright, light, without need for food or drink, clothing or other physical pleasure, and the souls of those who lived according to the Gospel will go to Paradise, while the unrepentant and wicked will go to Hell. And the true enjoyment of the saints and righteous will be in Heaven (which is why it is called Paradise), while the Hell of the wicked will be on earth . This enjoyment of the saints will be nothing other than that these souls will be perfected in knowledge so that they can perceive the mysteries of God, which we now know only by faith. First, that the Prophets of the Old Testament, which we also accept, refer in their prophecies to Jesus and all that He did and what happened to Him, and even all that His Disciples did with His power. The Oracles of the Ancient Greeks also prophesied about Him, as delegated by God, as well as the astronomers of the Persians and Ancient Greeks. All these prophecies express great respect for Jesus. And that these prophecies are authentic, we can demonstrate. Second, that the books of Holy Scripture which contain our faith agree with each other in all things, because those who wrote them had the same teacher, namely the grace of God, because otherwise they would have disagreed about something. Third, that this faith, although it was new and strange, was accepted by people everywhere and quickly, although they faced many dangers. And it was accepted not only by simple people, but also by the educated and the wise. This is the reason why the delusion of the Greeks completely ended. Fourth, that this faith contains nothing which is not feasible, and is not consistent with human reality, and that nothing of it is based on material things, but everything has a spiritual character. This faith is the way that leads the souls of people to the love of God and towards the future eternal life. Fifth, that those who accepted this faith and lived virtuously according to the commands of Jesus, received from God great gifts, and did many miracles by invoking the name of Jesus, which would not happen if this faith was not true. Sixth, that what is said by some against this faith we can respond to very easily and with logical arguments. Seventh, that this faith was fought against with many tortures and murders by the then emperors and rulers throughout the whole world for 318 years and, while they were pagans and believed in many gods, failed to prevail, but this faith prevailed in the world and remains until now and when the Lord comes He will find it. And if this faith was not God's will, it would have dissolved very easily. To this God be the glory. Amen.